Dimensions 0.75 by 4.25 by 6.87 in. 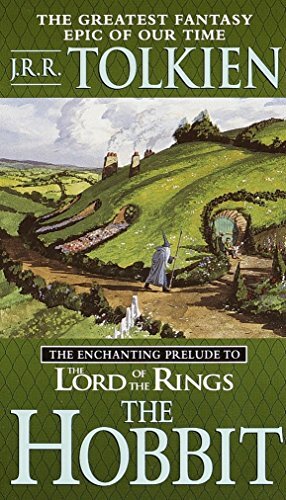 The prequel to the epic fantasy saga The Lord of the Rings chronicles the adventures of the inhabitants of Middle-earth and of Bilbo Baggins, the hobbit who brought home to The Shire the One Ring of Power. Reissue. Along the way, the company faces trolls, goblins, giant spiders, and worse. But as they journey from theÂ wonders of RivendellÂ toÂ the terrors of MirkwoodÂ and beyond, Bilbo will find that there is more to him than anyoneâhimself includedâever dreamed. Unexpected qualities of courage and cunning, and a love of adventure, propel Bilbo toward his great destiny . . . a destiny that waits in the dark caverns beneath the Misty Mountains, where a twisted creature known as Gollum jealously guards a precious magic ring. About: Bilbo Baggins, a respectable, well-to-do hobbit, lives comfortably in his hobbit-hole until the day the wandering wizard Gandalf chooses him to take part in an adventure from which he may never return. Large print edition from Thorndike Pr (April 1, 2003); titled "The Hobbit or There and Back Again"
With Michael Hague (other contributor) | Ill edition from Houghton Mifflin (October 29, 1984); titled "The Hobbit: Or, There and Back Again"
About: Bilbo Baggins, a respectable, well-to-do hobbit, lives comfortably in his hobbit-hole until the day the wandering wizard Gandalf chooses him to share in an adventure from which he may never return. With Lester Abrams | from Harry N Abrams Inc (October 1, 1977); titled "The Hobbit: Or, There and Back Again"
About: The adventures of the well-to-do hobbit, Bilbo Baggins, who lived happily in his comfortable home until a wandering wizard granted his wish. Reissue edition from Del Rey (January 1, 1992); titled "Hobbit or There and Back Again"
With Michael Hague (other contributor) | from Houghton Mifflin (October 30, 1989); titled "The Hobbit: Or, There and Back Again"
About: Bilbo Baggins, a respectable well-to-do hobbit, lives comfortably in his hobbit-hole until the day the wandering wizard Gandalf chooses him to share in an adventure from which he may never return. With Mariam Seedat, Frances Ulrich | from Houghton Mifflin (October 1, 1988); titled "The Hobbit"
from Ballantine Books (May 30, 1976); titled "The Hobbit"
With J. R. R. Tolkien | from Demco Media (January 1, 1992); titled "Hobbit or There and Back Again"
With J. R. R. Tolkien | from Turtleback Books (August 1, 2002); titled "Hobbit, Or, There And Back Again"
With J. R. R. Tolkien | from Turtleback Books (September 1, 2001); titled "Hobbit"
With J. R. R. Tolkien | from Turtleback Books (September 1, 1999); titled "Hobbit: Or There And Back Again"
With J. R. R. Tolkien | from Turtleback Books (October 1, 1989); titled "Hobbit: Or There And Back Again"